Glorious sunshine illuminating the rolling hills, wisteria climbing up the late Victorian arches, busy bees making honey for people sitting in a circle on the bouncy grass to discuss whether Plato would have approved of today’s silver haired politicians. Is this heaven? 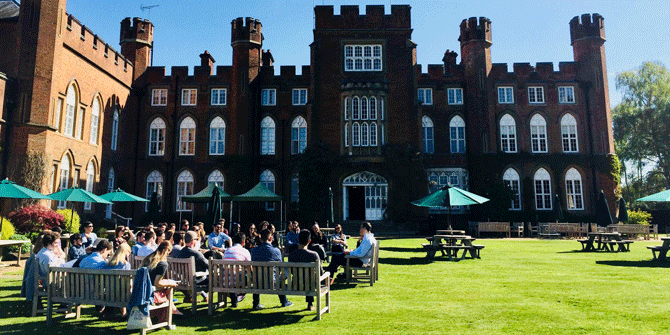 No, it’s the Government Department’s annual retreat to Cumberland Lodge, which as a former royal residence in Windsor Great Park, comes pretty close to heaven. This year’s theme was ‘Do your grandparents hate you? Generational divides in politics’, and as the interaction between students, research staff and illustrious guest speakers showed, cleavages are considerable. Will Brett (The New Economics Foundation) demonstrated the extraordinary spatial segregation by age that reinforces the divide between young cities and decaying towns. Lord David Willets and Rupa Huq MP highlighted the cultural differences between different generations that make it increasingly difficult for politicians to address everyone’s concerns. Dr Chris Prosser (British Election Survey) argued that the British General Election of 2017 was the most age-divided ever, with millennials disagreeing with baby boomers on almost every electoral issue. The youngest generation, born into prosperity and more connected than ever to their peers around the globe, are angry, lonely and disappointed. Dr Gita Subrahmanyan (Inclusive Development Lab) stressed that despite emerging countries’ greater optimism, only 42% of youth globally and a disheartening 30% in established economies believe that their lives will be better than those of previous generations. Has the past really stolen the future, as Jonathan White (LSE) wondered? If so, where does our pessimism come from? One possible answer is the current economic system. A lack of affordable housing for the young coupled with an unprecedented concentration of wealth among the baby boomers calls for redistribution. Another is a cultural shift whereby the usual generational difference in political and social attitudes (progressively more liberal from one generation to the next) is counteracted by the fact that an ageing population becomes continuously more conservative, traditionalist, even authoritarian (as seen in the appalling correlation between support for Brexit and capital punishment). A deeper, conceptual analysis was discussed with Prof David Runciman (University of Cambridge): If democracy is the politics of the majority and the majority is now old (the EU median age has reached 43, twice as much as a century ago), democracy as a political system is flawed, catering to old people while leaving innovative segments of the population without a voice. Representative democracy has become unrepresentative of the citizens whose future is supposed to be decided. How can we rethink our idea of democracy? How can we correct a configuration in which politics does not catch up with demographic change? Exciting solutions were considered: Should we have not only a minimum, but also a maximum age for voting? Should parents have one vote for themselves and one (hopefully more altruistic) vote for each child? Should we elect younger politicians and new parties (like Macron’s La république en marche) to inject dynamism into our political landscape? Should we increase inheritance tax to redistribute the riches of the baby boomers? Should the private sector accelerate the digital revolution to empower young people? Should we incentivise natural reproduction or embrace youthful immigration to balance out the stark differences between the age cohorts that are currently clashing against each other? Could the issue of climate change be used consciously to raise awareness for intergenerational justice across all age groups? The necessity to reinvent Britain after Brexit might well be an opportunity to test some new schemes. Yet before we all return to London to implement these and other ideas to radically improve the world we live in, a few words of gratitude are in order. Thank you to the educational charity Cumberland Lodge for hosting us for three days and spoiling us with culinary delights. Thanks also to the Royal Chapel, where the average age of attendees may have been high, but the quality of the music was even more so. Thank you to the chairs, Lea Ypi and Lucia Rubinelli, who ensured orderly proceedings. Thank you to the organisers, Jill Stuart, Emma Rees and Mark Bryceland, who worked very hard to put together a fantastic programme – especially a memorable pub quiz, which included a round of recreating cultural heritage sites from all centuries with play doh (probably to reflect on the passage of time and our own vanishing youthfulness). Thank you to the LSE Government Department, which in the hustle and bustle of an intense exam period gave us the opportunity to discover new ideas and discuss them freely in the serenity of a stunning country house. 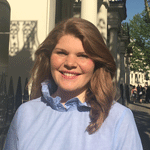 Astrid Hampe is a Phd candidate in Political Science working on historical injustice and the wider relationship between politics and time.